The AIM spacecraft uses solar occultation to measure ice content in the upper atmosphere. 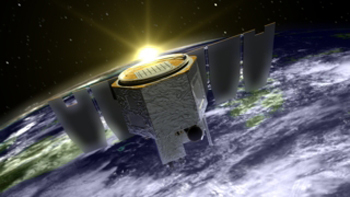 The Aeronomy of Ice in the Mesosphere (AIM) mission, which studies polar mesospheric clouds(PMCs) and the atmosphere, was recently evaluated in the 2010 Senior Review of the NASA Heliophysics Mission Operations and Data Analysis program. The AIM mission received an “excellent” rating in both of the two categories evaluated—scientific merit and contribution to heliophysics goals. As solar activity increases, the AIM mission should provide further data relating to solar forcing and the upper atmosphere; the mission has been extended through FY 2012. LASP Mission Operations currently operates AIM. LASP also built two of the instruments on the spacecraft: the Cloud Imaging and Particle Size and Cosmic Dust Experiment instruments. LASP scientists and data systems personnel analyze AIM data to investigate PMC variations. The PI of the AIM mission is James Russell, III; for more information about AIM, please visit: http://aim.hamptonu.edu/ .